Event Services: Karaoke DJ Rentals, Karaoke Machine Rentals & More! You know that music can make or break any event, whether it’s a corporate event or a wedding, an anniversary or birthday. At San Jose’s A Karaoke DJ Rental, we know that too, which is why we’re committed to making sure you have the perfect tunes to accompany whatever style of event or celebration you have in mind. We pride ourselves on consistently offering our clients an outstanding experience, and we won’t stop until you’re satisfied. Our diverse range of capabilities and talents, gathered in our 22 years in the business, enable us to facilitate the planning of your event, help you choose the most appropriate music, coordinate the schedule and fulfill your entertainment needs on the day of your event. In other words, we’ll handle every aspect of your event from planning all the way through completion – we deliver our karaoke equipment for free, set it up and ensure that it’s all working prior to your event, and come back to tear it all down and return it once it’s done. You’ll get complete end-to-end service with A Karaoke DJ Rental, ensuring that you don’t get just music, but the right music for your event, allowing you to relax, sing and dance the night away. whatever combination works best for you, we’ll get it all set up and be sure it’s working properly. The important thing is that we customize your package to the entertainment needs of your unique event. We can set up our karaoke machine, loaded with more than 35,000 songs, and offer you an assistant to run it for you or show you how to do it yourself. You can also choose to get a DJ table set up with our huge library of songs stored on a hard drive for convenient access, and either spin tunes yourself or leave it to one of our experienced DJ to keep the jams playing all night. You can even have both – a great choice for larger parties – and either take turns queueing up the songs or leave it to our available male and female assistants to never let the energy stop. Whatever you’re looking for from your party and event entertainment, you’ll get it your way, every time. Since 1985, A Karaoke DJ Rental has had the privilege of providing excellent communication, negotiation and event execution services for countless events in the San Jose region. We’re equipped to handle corporate events, team-building exercises and office parties, weddings and bar/bat mitzvahs, anniversaries, birthdays and any other occasion you can think of. What’s more, we make sure that the music is appropriate to each event. Have you ever been to a wedding or party where the music was just wrong – no one was dancing and the whole thing was just a bummer? So have we, and we’re going to make sure that doesn’t happen at your event. We carry a vast variety of different music styles, ranging from classic tunes through all mainstream styles of music offered today, ensuring that your guests aren’t just comfortable, but engaged with the music and having fun. 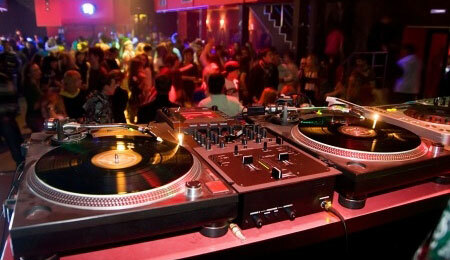 A Karaoke DJ Rental is well known for the impressive breadth of our music library. Our diverse personal and professional background, backed by more than 22 years of experience in the DJ and karaoke business across Silicon Valley has helped us build and grow our ultimate music catalog to include more than 35,000 songs for clients to choose from. More than that, we know what works, how to get the party started, how to keep the energy up, and respond in real time to the mood of your event – we’ll pump out invigorating songs to keep the pulse alive if the dance floor starts to clear, or amp down the energy as the night winds down. We carry thousands of hours of music that cover everything from the obvious choices and your requested styles to some very unusual and obscure genres. With an unsurpassed understanding of the subtleties of each event or corporate event, A Karaoke DJ Rental will play music that is appropriate for the occasion, the environment and the mood of your guests. Whether your musical tastes extend to songs from the ‘50s, ‘60s, ‘70s, ‘80s, ‘90s or today, or you want some Afro-Cuban hits or a bit of old school jazz, we’ve got you covered. With folk and funk, reggae and rock, trance and traditional, we run the full gamut of artists and songs from A to Z. From songs to dance to like salsa or swing, to amped-up and energizing rap and club mixes, there’s unlikely to be a single song your guests might request that we won’t have. After more than two decades years in the business, you learn what works and what doesn’t, and our long list of references from satisfied clients demonstrates our commitment to making sure your event leaves everyone happy. We provide music to events from our home near San Jose to as far as Monterey, and all across the Bay area. Queue up your next song and request a quote from A Karaoke DJ Rental online now or call us today to get your party started. All event bookings require a minimum 50% down payment by the contract date. Full payment is due one week before the event date. A Karaoke DJ Rental only accepts CREDIT CARDS as payment. Certain special discounts may apply, please Contact Us.